The discovery of streptomycin in 1944 provided the first effective treatment for tuberculosis. Ever since then, we have fought an escalating battle with bacteria using streptomycin and other aminoglycoside antibiotics. Researchers have discovered many natural aminoglycosides made by bacteria, and chemists have created entirely new antibiotics based on these effective natural defenses. In turn, bacteria have developed many different ways to protect themselves from attack by these antibiotics. These include molecular methods to control the entry of the drug into cells, pumps to eject drugs out of the cell (see the Molecule of the Month on multidrug transporters), and enzymes that directly modify both the target of the drug and the drug itself. The major way that tuberculosis bacteria become resistant to streptomycin is to change the target of the drug. 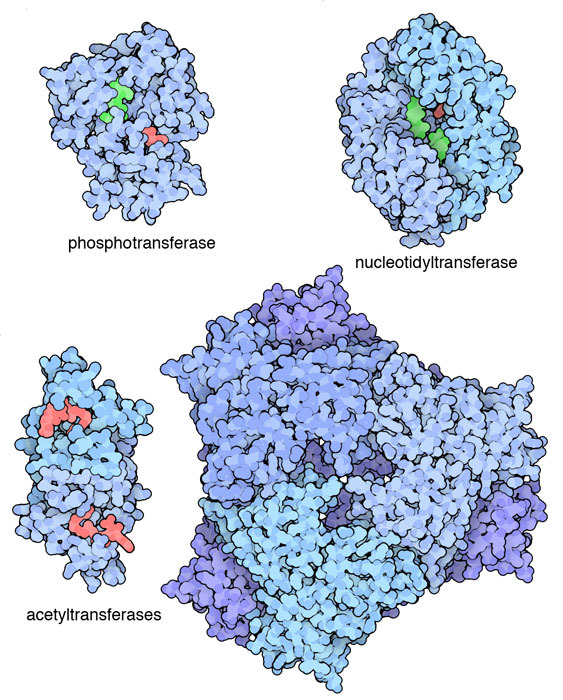 Aminoglycosides attack the ribosome, as shown in more detail below. The drug binds in a tight pocket on the small subunit of the ribosome, corrupting the proper pairing of codons and anticodons. 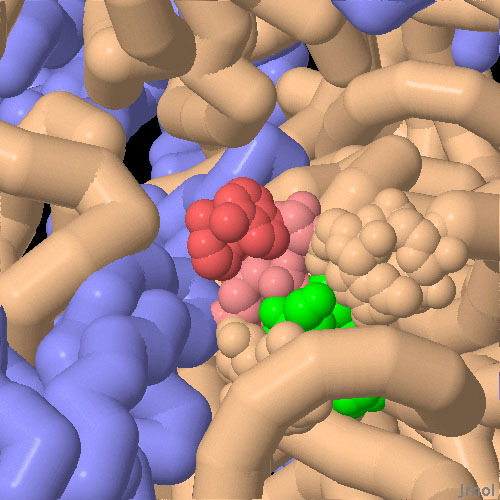 Drug resistant bacteria, however, have developed enzymes that add methyl groups to specific bases in their ribosomes, making this pocket a bit too small for the antibiotic to bind. 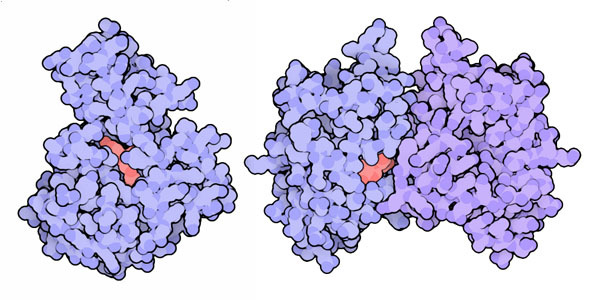 Two examples are shown here: the one on the left adds a methyl group to guanine 1405 in the ribosome (PDB entry 3frh ), and the one on the right modifies adenine 1408 (PDB entry 3pb3 ). Bacterial enzymes that inactivate antibiotic molecules. As chemists developed more and more types of aminoglycosides, including many that work against methylated ribosomes, bacteria developed methods to attack the drugs directly. Dozens of different enzymes have been discovered in different strains of bacteria, and to make things worse, bacteria exchange these enzymes by passing plasmids back and forth. They fall into three major classes: ones that connect a phosphate to the drug, ones that add an acetyl group, and ones that add AMP. The structures of these enzymes are as diverse as their chemical reactions. Four are shown here: a phosphotransferase from PDB entry 1l8t , a nucleotidyltransferase from PDB entry 1kny , an acetyltransferase from PDB entry 1bo4 and an unusual acetyltransferase that can modify the drug in as many as four places, from PDB entry 3r1k . An amazing series of structures, in PDB entries 1j5e , 1ibm , 1ibk and 1ibl , have revealed the way that aminoglycosides work. Treatment with aminoglycosides causes the bacterium to incorporate errors into their proteins, and these corrupted proteins ultimately kill the cell. By comparing the structures of normal ribosomes with antibiotic-bound ribosomes, researchers have discovered that the antibiotics weaken the proofreading ability of the ribosome, allowing improper tRNA molecules to bind to codons in the mRNA. To explore these structures, click on the image here for an interactive Jmol. Many other structures of enzymes that modify aminoglycosides are available at the PDB. You can find structures of the enzymes alone, and structures with antibiotics and cofactors. Researchers are attempting to fight antibiotic resistance by developing inhibitors that block these enzymes. To find these, you can start by searching the PDB for `aminoglycoside inhibitor`. M. S. Ramirez and M. E. Tolmasky (2010) Aminoglycoside modifying enzymes. Drug Resistance Update 13, 151-171. S. B. Vakulenko and S. Mobashery (2003) Versatility of aminoglycosides and prospects for their future. Clinical Microbiology Reviews 16, 430-450. J. M. Ogle, D. E. Brodersen, W. M. Clemons Jr., M. J. Tarry, A. P. Carter and V. Ramakrishnan (2001) Recognition of cognate transfer RNA by the 30S ribosomal subunit. Science 292, 897-902. G. D. Wright (1999) Aminoglycoside-modifying enzymes. Current Opinion in Microbiology 2, 499-503.